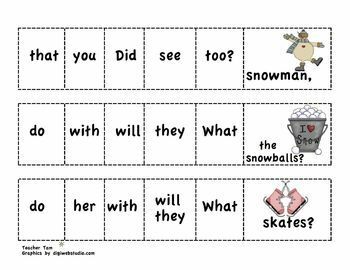 Kindergarten Sight Words | First Grade Sight Words for Winter with BOOM CARDS. 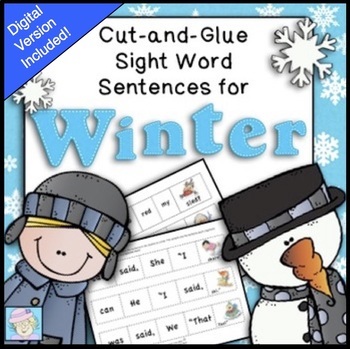 This winter themed set of 45 cut-and-glue sight word sentences includes more than 70 Dolch sight words for kindergarten and first grade. 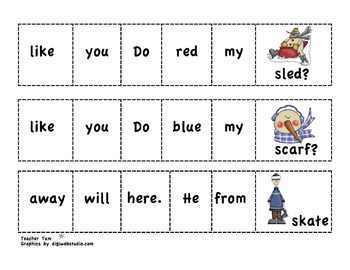 They are similar to my other sets of cut-and-glue sentences with new sentences and winter themed clip art. These work great as a center activity, in small groups, or as a large-group activity. This set now includes digital BOOM CARDS!CLICK HERE to see the included set! *****READ MORE ABOUT BOOM CARDS: Boom Cards are self-grading, DIGITAL resources. They live in the cloud. They can't be printed. They play on most modern browsers, Android, iPads, iPhones, and Kindle Fires. You open a Boom Learning account to play them (to protect the children). Create Fast Play pins to assign your Boom Cards to students. Grab a 2-page sample of this product on my blog! 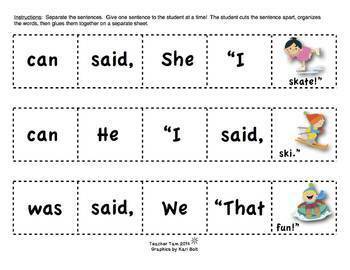 Save $13 and get cut-and-glue sentences for all year when you purchase the COMBO PACK! Also, don't miss the DIGITAL Back to School Sentences! For more winter fun . . .
*****READ MORE ABOUT BOOM CARDS: Boom Cards play on modern browsers (released in the last three years) on interactive whiteboards, computers and tablets. Boom Cards apps are also available. Not sure your browser is modern enough? Try a free Boom Cards deck first. When you redeem your purchase, Boom Learning opens an account for you if you do not already have one. For TpT customers new to Boom Cards, Boom Learning will give you a FREE, 3-month trial. Starting January 1, 2018, the free trial will be 150 students for 3 months. At the end of that year, you may renew or choose not to renew. If you do not renew, you will be able to continue using Boom Cards with the Fast Play feature. Fast Play does not track individual progress.